Meet Emma. She's a Danish designer and friend who's developed a whole new angle on urban rainwear, among many other things of course. The girl's got talent. 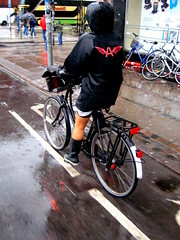 Rainwear is, of course, a necessary evil for many people on the urban landscape, whether pedestrian or cyclist. (It's actually something that people quite often need). 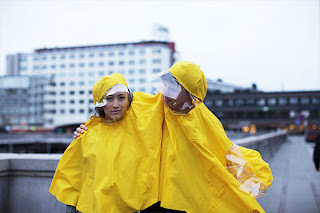 Emma was inspired by the classic sou' wester raingear material and many of the unique rainwear ensembles in Japan when she whipped together this elegant raindress. Considering the fact that cycling in skirts or dresses is as easy as ringing a bicycle bell, this outfit could be the perfect solution to spring/summer/autumn downpours. The front is designed longer than the back, just in case you hop up onto a bicycle, so that your thighs stay dry. Sweet little detail. There are various ways to tackle precipitation whilst moving about the urban landscape. Some cooler than others. Emma's creation takes urban rainwear to the next level. Another creation from Emma's hand is the basket and hand cover, inspired by the bicycle culture of Japan and given a Nordic workover. Complete with a simple, elegant top to ward off summer showers. Last but certainly not least is this brilliant buddy raingear set with room for three good friends. 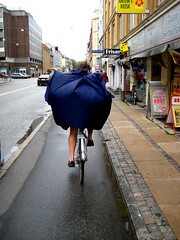 Perhaps a bit tricky on bicycles but perfect for the summer music festival season. The famous Roskilde festival, or even Glastonbury in England, should be selling these during their notoriously rainy festivals. Visit Emma Jorn's website here. Wow - that she's got talent is no understatement! These are brilliant. But where can I buy?? 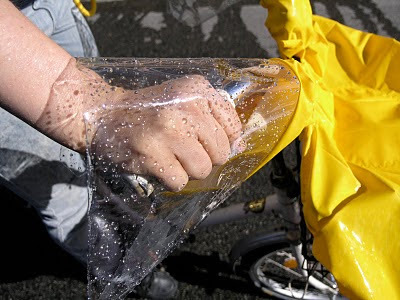 stylist gloves for the rain, and for the bike, too!! Oh, this is excellent, someone is taking hi-viz mainstream. We've argued for this for a long time, that just as today you see kids wearing football shirts with TARPS-rescued banks on the front of them, whereas hi-viz clothing could become the new fashion. But this designer has done that by making the things look nice, rather than following our tactic of convincing people that waterproof trousers and a hi-viz "builders" top is in fact stylish. Very stylish designs. I like them. Btw, check out Norway's consul general in Guangzhou, China, cycling to work at www.wafflesandsteel.com. I hope for less rain and a warm spring ! The last one is awesome however a regular rain poncho does just a good job as long as you are all friends! These are so fun. Looks like another reason to bike in the rain! Love the top yellow jacket. I would love to rock that on my bicycle. Awesome designs - very clever!